Part of Lenovo's distribution network in China. In the midst of a steady stream of gloomy economic news, an up and coming Asian economic power has snatched a high-stakes, tech industry crown from the U.S.
China was the world's largest personal computer market in the second quarter of 2011. 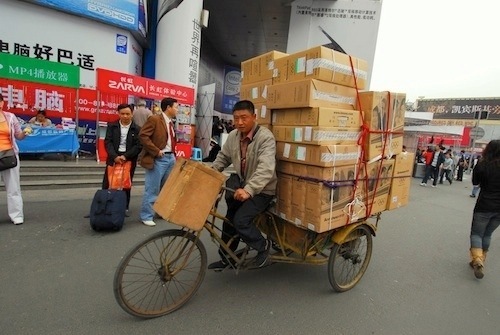 This marked the first time that more PCs shipped in China than in the U.S., according to research firm IDC. Despite the on-going debate over the presumed death of the PC, an estimated 350 million are expected to be sold this year even amid the growth of tablets and smartphones. This historic shift comes as emerging markets are expected to see 11 percent growth in PC sales over last year, according to research firm Gartner. By contrast, PC sales in mature markets are forecast to drop 3.7 percent between 2010 and 2011. Over the past few decades, China has evolved from an agricultural and heavy industrial base into a more open, diversified economy that draws upon information, knowledge and global connectivity and collaboration. While cities such as Hong Kong, Beijing and Shanghai have robust, mature economies, China still has enormous potential for emerging market growth from its inland cities and a population that dwarfs the established U.S. PC market by more than a billion potential customers. "China has a surprisingly high number of advanced and wealthy users although this percentage is very low compared to the percentage of 'developing' users," said Steve Paine, consumer technology reviewer atUltrabooksNews.com. The pace of change is obviously fast in these huge, emerging parts of the China market." China is now "the first market for Intel," according to senior executive Sean Maloney who recently was named chairman of Intel China. Maloney, who once served as head of Sales and Marketing for Intel in the Asia Pacific Region, was tapped to help harness the growth potential and lead Intel's overall efforts in China. "The PC still has room to grow and we need to kick-start that," said Maloney. The momentous growth of PC sales in China in the second quarter pushed the market more than a million units ahead of the U.S. IDC estimates that approximately 18.5 million PCs were shipped in China. Although IDC predicts the U.S. market will hold a slim lead of just more than a million units shipped for 2011 in total, China is expected to dominate next year. IDC forecasts that China will outsell the U.S. by more than a billion dollars, shipping 85.2 million units versus 76.6 million units in the U.S. in 2012. "China's lead in the PC market is a huge shift that reflects the rising fortunes of emerging markets as well as the relative stagnation of more mature regions. While the immediate economic circumstances in the U.S. and other markets had a significant impact on the timing of China's move to the lead, they have not changed the trend, but accelerated it," said Loren Loverde, program vice president of IDC's Worldwide PC Tracker. People living in emerging markets such as China, Brazil, Mexico, India, Turkey and Indonesia are seeingcomputers becoming much more affordable, according to data that Intel CFO Stacy Smith shared with investors in May. The cost of an average-priced laptop in China, for example, has dropped dramatically from 174.7 weeks of average income back in 1995 down to just 7 weeks of income in 2010. By 2014, the cost will drop to the equivalent of 2.6 weeks. That will put China very close to the worldwide average of 2.3 weeks of average wages. Overall demand for personal computers, however, is being hotly debated amid the rapid popularity of tablets and smartphones. Gartner's September report shows economic woes in many parts of the world are hampering PC sales, especially in the U.S. and Western Europe, as is increasing demand for smartphones and tablets. "More worrisome for the long term is that Generation Y has an altogether different view of client devices than older generations and are not buying PCs as their first, or necessarily main device," said Ranjit Atwal, research director at Gartner, when the report was released. "For older buyers, today's PCs are not a particularly compelling product, so they continue to extend lifetimes." Gartner actually lowered its 2011 worldwide PC shipment estimates from 9.3 percent to 3.8 percent, bringing it more in line with the IDC estimate of 4.2 percent, which was trimmed from 7.1 percent in June. China and other emerging economy nations are becoming the sales growth engines for PCs as sales slow in more mature market economies, according to IDC. Taiwan-based PC maker Acer recently reported its first-ever revenue-losing quarter. Dell and HP also reported declines in PC sales to consumers, all occurring in the quarter when more PCs were shipping in China than the U.S. for the first time. In late August, HP said it was inclined to spin off its $40 billion PC business, the world's largest. The company then clarified its commitment to the future of personal computing with print ads that said, "We see a future where they will be able to own a PC for the first time, giving them the ability to learn more, create more, produce more and improve the quality of their lives - things that simply can't be done on other kinds of devices." HP claims that it sells two PCs every second somewhere in its market of 170 countries. China-based Lenovo, which bought IBM's PC business in 2005, is currently the third-largest PC maker after HP and Dell, according to IDC. Lenovo CEO Yang Yuanqing recently told the Financial Times that "emerging markets, including China, continue to grow and outpace" the overall PC market, while in mature markets the corporate PC replacement cycle "remains strong and consistent." Intel President and CEO Paul Otellini said during Intel's July earnings call that emerging markets such as Turkey and Indonesia were up 70 percent, India was up 17 percent, Russia was up 15 percent, China was up 14 percent and Latin America as a whole was up 12 percent. He pointed to growth in Brazil that would make that country the world's third-largest PC market next year, after the U.S. and China. "It's the real-time dynamic of these markets waking up, an increase in disposable income, a decrease in the cost of computing and bandwidth for connectivity all coming together," said Otellini. He also talked about what he sees as a common approach by many people in emerging markets. "When it's your first time to buy a TV or computer, you want value," he said. "You want something that will last, that's going to be good for your family for more than a year or two and that tends to have you buy up a bit."